The Malta Flag has a high standing in the maritime world, which is evidenced by both the number of ship-owning and ship-management companies of repute which register in Malta, and also by the confidence shown by the leading international banks and financiers who recommend the Maltese register. Registering under Malta Flag offers a variety of benefits and advantages, such as low company formation and ship registration costs, complete tax exemption to owners, charters and financiers of Maltese ships over 1000 net registered tons, as well as no restrictions on sale or mortgaging of Maltese ships, or sale or transfer of shares of a company owning Maltese ships. 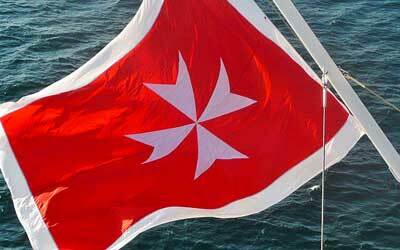 Registration of a Maltese shipping company is the primary step in the process of Malta flag registration. However, the principal base of the business is not required to be located in Malta, and the company must include no less than two shareholders, both of which can be either foreign corporate bodies or individuals. Provisional registration can be carried out relatively simply and efficiently as the registration process is a relatively straight forward operation. However, authority to operate a ship will only be given once the administration is satisfied that the vessel conforms to all the required standards set forward by the relative international conventions. In order to apply for provisional Malta Flag registration, an application is required by the owner or authorised representative, as well as a declaration of ownership made before the registrar. In conjunction, proof of qualification to own a Maltese ship is also required, along with evidence of seaworthiness and the payment of initial and annual registration fees. If the vessel has not been registered elsewhere prior to application for a Malta Flag, then a builder's certificate will be required upon registration. Otherwise, a bill of sale or any other documentation by which the vessel was transferred to the applicant will be required. If not the first registration, then a cancellation of registry certificate from the previously registered country will need to be included with the application also, as well as a certificate of survey and a copy of the tonnage certificate certifying that the vessel has been surveyed in accordance with Maltese regulations. Finally, you will also need to submit at least one crew list accompanied by photocopies of the officers' certificates of competency. Should you require any clarification or further information on the Malta Freeport or Maltese Flag registration, please do not hesitate to contact Seatrans for additional guidance.